I am having a problem with my custom blocks rendering, and I want to programmatically manipulate the blocks to troubleshoot the issue. My site's header and footer are made of custom blocks, so I should be seeing their ids. How can I programmatically access my custom blocks? You can see that all the system blocks show up, but my custom block does not. And of course, I've cleared the cache many times to get to this point. The type of entity you are dealing with defines the hook you need to implement; in this case it is NOT block but rather block_content, as provided by the "Custom Block" core module. N.B. : It is generally good practice to use more specific hooks when possible, as it will have a general effect on your code's performance, i.e. your hook implementation will be called less times if it is more specific. In your case, instead of going through all blocks available on any page during page loading, you are going through only custom blocks (block_content entities). You're using the built-in custom block which ships with Drupal. In your code your getting the baseId which is in your case block_content and it is shown in your screenshot actually. I think you need to use $block->id() instead. 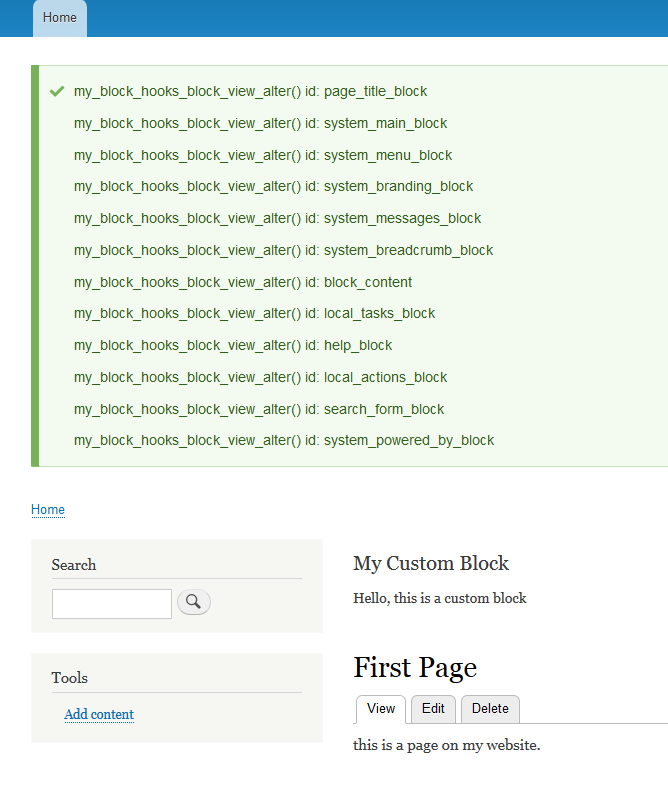 Make sure you actually have the custom block nicely defined and placed on your Manage blocks page. Make sure your custom block is actually visible on the page? Return some temporary output like "foo" from your custom block plugin and make sure that the "foo" is visible on the page. Try removing cache for your block temporarily by adding $build['#cache']['max-age'] = 0; to your block's output. Drush drush cr or clear cache and see if your custom block is visible. Check the visibility rules for your custom block in block configuration. Try removing all visibility rules temporarily and see if the block shows up. If you've implemented any block access rules, try disabling them to see if your block becomes visible. Multiple blocks can have the same Base ID. Try doing $block->getPluginId() or $block->id(). In your case, it should give you an item like block_content:UUID where UUID is the unique ID of the custom block you created in your custom block library. 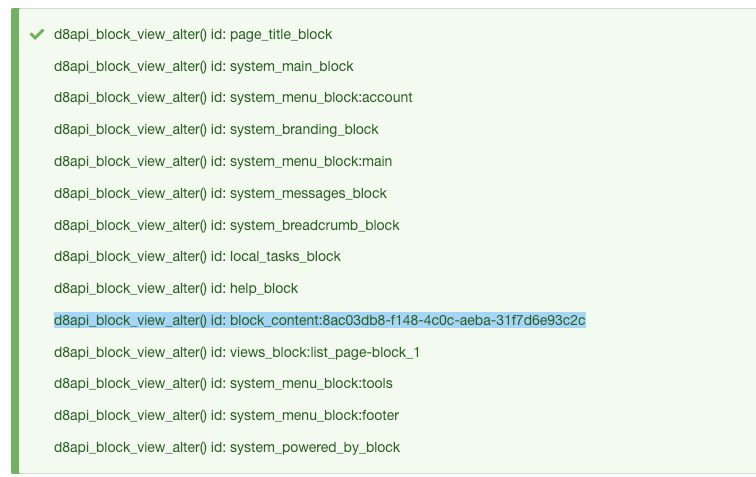 The ID of your block not showing up is basically sounds like your block is not being displayed on the page. I am going to take a wild guess, but have you tried clearing the cache? Custom blocks normally do not contain dynamic data and as such can be heavily cached. This causes the block output to be rendered without your hook getting called. In the configuration menu go to development > performance and hit the 'Clear all caches' button. Then go back to the page with your blocks and see if it made a change. Alternatively you can install the devel module to clear the cache from each page directly. 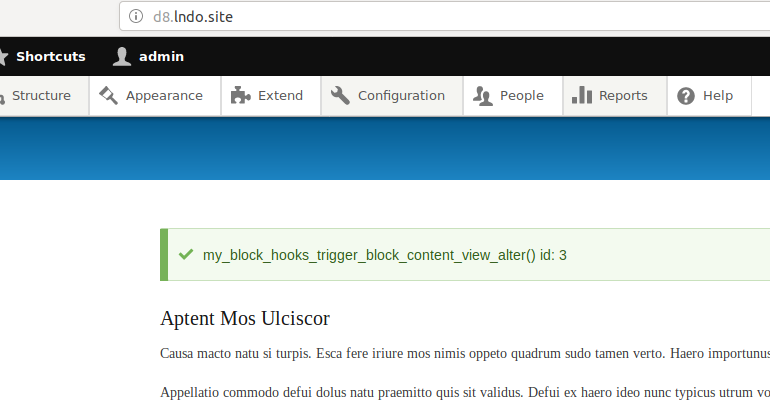 How can I add a header and footer field to all drupal generated blocks? How to render only markup in region template? How many blocks can be handled? How do I show a block in a region?